Dog Agility is a very popular sport which requires dogs to negotiate a series of obstacles, directed only by the handlers body language and verbal cues. It’s fast, varied, and lots of fun for dogs and handlers! 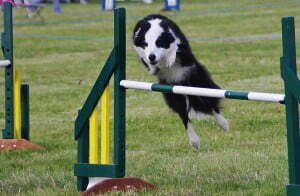 The sport requires a lot of dedicated training and dogs usually take 12-18months to become ready for basic competition. Even then, dogs and handlers will continue to train throughout their careers to develop their skills, and learn new ones! Almost all breeds of dog can take part; the only exceptions are giant breeds like Saint Bernards or Newfoundlands, and some long-backed breeds like Dachshunds or Corgis. All that is required is that your dog is fit, healthy, and has a desire to work. We offer various agility classes which focus on providing a great foundation set of skills for dog and handler, as well as building your relationship with your dog. We work closely with the experienced trainers at a local agility club in Huddersfield – All Four Paws ATG – to ensure that we’re providing a great foundation which will allow you to pursue agility to any level you want. All Four Paws ATG focus on reward-based training for competitive level agility, and provide a destination for any of our North K9 class graduates who might want to go toward competition in the future. This class is appropriate for dogs aged 8-10 months upwards. Use of equipment is minimal and involves no impact work. To enroll in this course you should ensure that your dog has a basic level of obedience. If you’ve never done any kind of training class with your dog before, we recommend doing some of our Life Skills or Obedience classes first! Please see the Calendar for class dates. In our Beginner Agility classes, you and your dog will learn how to apply your foundation skills to equipment-based agility, and will work toward negotiating simple courses with confidence, speed, and enthusiasm! These classes are aimed at those who don’t want to compete. However, for those who might want to pursue competitive agility in the future, these classes offer the perfect way to try out agility at an equipment-based level, and will enable an easy transition to competitive training. To enroll on this course you must have completed our Agility Foundation Skills and Further Agility Skills courses first, OR be an existing member of All Four Paws ATG. Intermediate Agility classes offer more advanced training for dogs who have progressed from our Beginner Agility class, or for handlers and dogs pursuing competitive KC G1-3/UKA Beginner/Novice. This class is focusing on developing drive, independence, and choosing the best handling options for sequences and short courses. Ideal for young competitive dogs, for those starting out in competition, or for older dogs who would benefit from confidence-building simple courses. If you haven’t trained with All Four Paws or in North K9 Agility classes before, please get in touch to discuss whether this class would be appropriate to your dog’s current level of training.